Sydney 1973: C&V Engineering Services was established at Mascot on the fringe of Sydney’s Eastern suburbs by Vito Pizzolato. This successful family run business continues on today under the leadership of son Mario ably assisted by sister Antonella. The company is committed to maintaining its 30 year reputation for providing unrivalled innovative engineering services to the Mining and Building & Construction Industries. 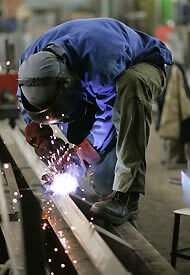 Initially the company specialised in the manufacture of Structural Metalwork & Site Welding. The company later became involved in Major Steel Construction Projects. The past 3 decades has seen the company become heavily involved in the Fabrication & Erection of Structural Steel NSW wide. Further expansion was embarked upon in 2005 at which time the company commenced to supply various Steel Fabrication Work to the Mining Industry Australia-wide. The company has an impressive portfolio of Major Projects undertaken in the Structural Engineering field. It enjoys a reputation of being known as Sydney’s finest Structural Steel & Metalwork Fabricator. The company’s many and varied clients enjoy the advantage of dealing with a One-Stop-Shop company that through two generations of experience are able to consistently deliver an extensive and quality range of products and services. Services at the forefront in the structural steel industry. up required to work co-operatively and effectively with other contractors on site. medium to heavy fabricated steelwork per week. C&V Engineering do have the ability to dramatically increase its capacity to over 200 ton per week. This has been done by successfully forming alliances with a number of workshops located both local and overseas. Our mission is to remain a dominant player in the market place, providing unrivalled service and innovative engineering solutions to the Mining and Building & Construction Industries. In support of this mission we are committed to developing cost-effective solutions that will meet the unique present and future requirements of our clients. To accomplish this, we investigate all reasonable options. Where appropriate, we seek out new technologies and design customized engineering tools. We strive to offer excellence in the design and delivery of engineering services. The company has a practical in-house quality assurance system in place. In the near future C&V Engineering Services will be compliant with all regulations by acceptance of ISSO9001-1994 placing all relevant operational policies and manuals in place. The company and staff of CV Engineering Pty Ltd are committed to achieving the highest standards of workplace health and safety by making OH&S our priority. This is achieved through our OH&S management system being compliant to AS/NZ 4801, meeting all legislative OH&S requirements and developing a saftey culture both at our workshop and on our work sites. We are committed to providing the high-quality products and excellent service our customers have come to expect from C&V Engineering Services, with closer ties than ever to established and new customers throughout the state. The company pursues its business operations with priority given to users in the field. We listen carefully to our customers to identify exactly what they require, giving value, professionalism and efficiency. By listening first, we are able to accurately meet the needs of the times, with products and services that maintain the highest levels of quality.